Philip Gross has been helping people give a spark to their own writing for more than half of his life. He has tutored at most of the Arvon Foundation houses, at Ty Newydd and on many writing residencies. He is equally at home leading workshops for adults and for children, and he has worked at every level of education from nursery classrooms to the PhD. He knows how to talk to people who say "I can't write, I'm not creative" just as much as to published writers honing their next book into its final draft. He knows how to listen. In one of Philip's groups don't expect to be told ‘Do this, do that... like I do.” Expect to learn to listen better to your own voice in your writing, and to each other's writing. Expect to be encouraged to take chances, learning when it's right to stop and think hard, and when to let the words fly. You may learn exercises and approaches you will want to use with other people. Download a simple one with endless variations (Gift Wraps pdf, 18kb). Teachers wrestling with the question “How do I help children feel at home with poetry?” (especially if you don't feel that at home with it yourself): download a print version of a talk to an IBBY (International Board on Books for Young People) conference click here (Our Place, pdf 113kb). And do look at some of Philip's writing about writing page, on this site. Philip's work enabling poetry in schools has often been site-specific, working for many years with the National Trust in Cornwall on their Arts In Trust scheme, both in houses and their outdoor sites. 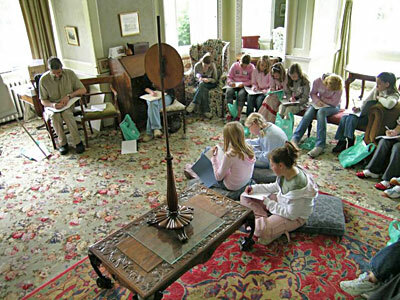 Working alongside visual artists led to close collaborations with Cornish artists Carole Page Davies and Patrick Haughton, and five years of on-site cross-arts workshops for middle-school pupils, alongside Lydia Fulleylove and Zélie Gross, at Northcourt Manor on the Isle of Wight. Read all about this project in this article from Writing In Education magazine. More recently he has worked with staff from the National Museum of Wales on poetry-and-science workshops — in particular, on worms and other creatures that live in extreme conditions: see our Dark Sky Park Zone. If you have a project — a residency or a one-off visit — you would like to discuss with Philip, use the contact form. In the last few years Philip has visited poetry groups from Cornwall to Yorkshire, from North Wales to Kent, to lead purpose-built workshops he plans with them in advance. Contact Philip if you would like to discuss a visit. 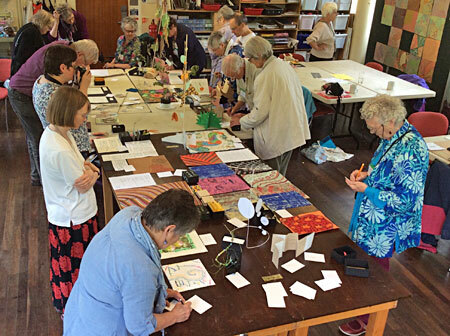 A special interest is working across the arts, as with the poetry-art workshops he has led with his wife Zélie at the Woodbrooke Quaker Study Centre, Birmingham. He is always looking for ways to cross new boundaries — with other writing forms, or other art forms, or with the sciences, as in his all-age workshops with National Museum of Wales staff for the Wriggle! 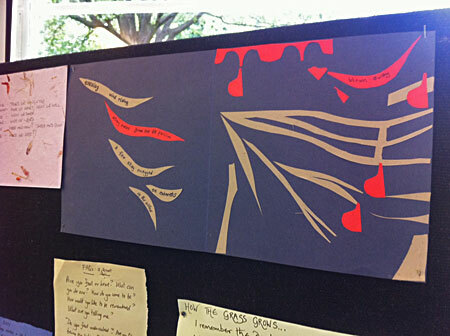 exhibition, writing about worms. Look in What's New [LINK] for the latest. 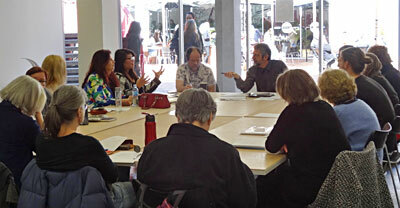 Philip takes on a limited number of people for one-to-one mentoring with their poetry. To discuss what you need, how Philip might help you with particular objectives and what your agreement might be, contact Philip.